Our south Florida neighbors, Marilyn and David, have a summer place in upstate NY just about an hour from where Doug and I are staying. We met them for lunch on a gorgeous afternoon last week at Frank Guido's Port of Call Restaurant overlooking the scenic Hudson River. 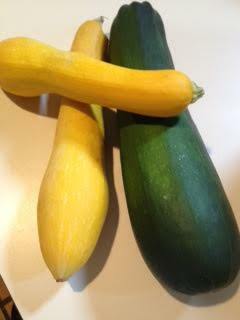 Summer squash and one giant zucchini! They brought us a bag of summer squash and one zucchini larger than any I’d ever seen – a gift from their friend's bumper crop. As we thanked them for their thoughtfulness, I was already thinking about what to make with the giant zucchini. Zucchini scooped using a grapefruit spoon which has sharp, jagged edges. 2. 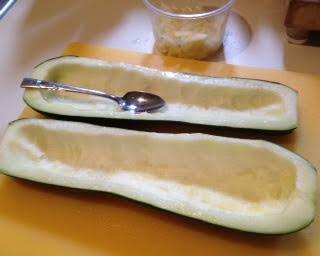 Using a spoon, melon baller, or grapefruit spoon, remove the seeds of each zucchini half; discard seeds. Carefully scoop out some of the pulp from the zucchini, leaving about a half-inch shell. Finely chop zucchini pulp and set aside until ready to cook. 3. Heat olive oil in a large skillet over medium heat. Sauté onion and garlic in hot oil until tender, about 5 minutes. Add ground lamb; cook, stirring often, until lamb is no longer pink, about 5 to 7 minutes. Drain excess lamb grease. 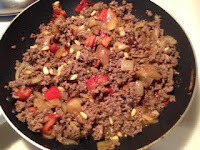 Stir in chopped zucchini pulp and diluted tomato paste to the lamb mixture. NOTE: I had a leftover grilled tomato and red pepper, so I took the liberty of adding those to the filling, too! Reduce heat to medium-low. Simmer mixture until the zucchini begins to soften about 3 minutes. 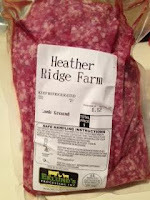 Season mixture with salt, black pepper, ground coriander, allspice and dried mint, if using. 4. Remove skillet from heat. add pine nuts to lamb mixture. Spoon mixture into the zucchini halves. 5. Pour one cup of the diced tomatoes and some juice into a baking dish to coat the bottom. 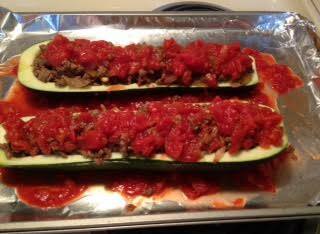 Place the stuffed zucchini halves on top of the tomatoes in the baking dish. Pour the rest of the tomatoes and juice over the zucchini halves. 6. In a preheated oven, bake, covered with foil, for 30- 35 minutes. 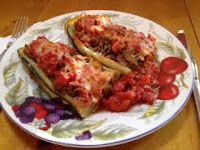 Remove foil and continue to bake another 10 minutes, or until zucchini is tender and tops are golden brown. Optional Garnishes: Crumbled Feta cheese -or- Parmesan cheese. If using either of these options, bake zucchini boats for 30 - 35 minutes as stated above, then sprinkle zucchini tops with either the crumbled Feta cheese - or - Parmesan cheese; bake, uncovered another 10 minutes or until the zucchini is tender and tops are golden brown. Serve with a side of rice or bulgur pilaf and salad to complete the meal, if desired.